Literally everyone writing fantasy and science fiction these days started out as a fan. So it would be unfair to criticize a first novel on the basis that its authors are a couple of starry-eyed fans who’ve been, shall we say, elevated to professional status before they were truly ready. 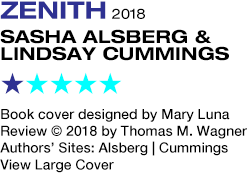 It isn’t the fact that Sasha Alsberg and Lindsey Cummings — whom I do not know and whom I have no reason to think are anything but very nice people — are a couple of popular booktubers that makes Zenith such a bad book. Zenith is a bad book for the same reason other bad books are bad. It’s painfully overlong, filled with dreadful writing, shoddy plot logic, and characters who are less believable than your stoner roommate’s latest excuse for not voting in the midterms. Still, it’s fair game to note that Zenith is also a book that, were it not for its authors’ considerable online following, would certainly have been a slush-pile reject. What it tries to pass off as a story is an eyeball-glazing mishmash of ideas and concepts swiped wholesale from YA bestsellers and blockbuster movies. You could even make a drinking game out of it if you weren’t terribly concerned about having a liver. Some Throne of Glass here, a little Guardians of the Galaxy there. Just in case you miss anything, the authors have helpfully thanked every one of their favorite writers in the acknowledgments. Androma Racella was once a Spectre, the personal bodyguard and companion to Kalee, daughter and heir of General Cyprian Cortas of the planet Arcardius. But when Andi and Kalee took one of the General’s ships on an unauthorized joyride, leading to an accident that killed Kalee, Andi fled the planet following her conviction for murder and treason. Now, she travels through space as captain of the mercenary ship Marauder, with an all-girl crew, because of course. Known as the Bloody Baroness (because what the hell), Andi, we are told, is feared throughout the galaxy for her bloodthirsty ruthlessness. We don’t exactly get a sense of how she became this person. But the authors are, to put it politely, a little clumsy in trying to sell Andi to us as both this terrifying killer of the spaceways, but also someone we’re meant to think is a pretty good person deep down inside. So what we end up with in Andi is a protagonist who kills wantonly, but then feels guilty about it and carves notches in her sword blades as an act of penance. Look: pick one. You want to have a bad girl hero? Just make her a bad girl hero. Andi and her ship are led into an ambush and captured by bounty hunter Dextro Arez, who also happens to be Andi’s ex, because this is just how things work in YA. Dex delivers Andi and her crew to none other than General Cortas, who, to Andi’s great surprise, offers her freedom if she rescues his son (and Kalee’s brother) Valen from the prison planet of Lunamere, where he’s being held captive and tortured by Queen Nor of Xen Pterra. Because you see, there’s a war in the backstory of all this, when Xen Pterra found itself running low on natural resources, and were refused help by the other worlds in the Unified Systems. Xen Pterra went to war, got walloped, and now Queen Nor presides over her dying world with one final, sinister plan for revenge, a mysterious weapon known as Zenith. It sounds like the kind of space opera that, while it may be a bit cartoonish, could still have been turned into rousing entertainment by an author with more experience and refined talent. Sadly, Sasha Alsberg and Lindsey Cummings make not only their lack of writing experience, but their lack of any kind of a background in reading and studying space opera and science fiction painfully obvious. So this is why, when they attempt such things as world building and character development, it all faceplants into pure silliness. We get such hilarious tropes as the single-purpose planet, delivered with a completely straight face. The Marauder is described as being “agile,” when a writer of adult space opera would know that agility is a superfluous quality in a ship that’s made for vacuum. We also learn that it’s built from “the rare impenetrable glass varillium,” and then we wonder later on how it is the ship has taken damage to its hull. We’re told that Andi has had plates of metal grafted into her cheekbones for shielding, and we wonder why the only other thing she wears is a form-fitting leather outfit. Is Andi expecting her enemies to only shoot her in the face? Also, how is it that this crew is so feared throughout the galaxy, when they’re apparently so dumb that they’ve run low on money for food and basic provisions because they’ve spent too much on hair products? And wait until you get to the action scenes, in which Andi and her girls are literally dodging bullets. I’m not kidding! More than once, an enemy is shown firing his gun, and then the girls jump out of the way! The relationship between Andi and Dex is boilerplate “I hate myself for loving you” twaddle. With very few exceptions — some of the members of Andi’s crew, like the 13-year-old gunner Ginny — the characters are all clichéd and boring, their motivations predictable when they aren’t simply puerile. And yet, this book thinks they’re so interesting that we’re presented with no fewer than half a dozen of them as viewpoint characters. I defy any reader to find any basis to connect with anyone. I say again, in the hands of greater talent, there’s an interesting seed of an idea here that neither Sasha nor Lindsey had the chops to pull off, which is that this is a story filled with nothing but villains. Zenith lacks anyone, really, who could count as a hero in the conventional sense. Everyone here is morally compromised if not outright evil, everyone here is pitching for a nasty fight. And a good writer could have really made something of this notion of a universe of bad guys and bad girls vying to be the baddest. But in the end, the book itself is what’s bad. Zenith is its own nadir. A 62-page early version of this book was self-published in 2016. Followed by a sequel.